I had 246 responses, which isn’t bad for a representative selection – the average UK opinion poll is about 1,500 surveyed for 67 million, so we’re doing rather well. However, balanced against that we have to take into consideration that this was a self-selected poll, in that people had to be sufficiently interested in Second Life to be reading this blog or another that recommended the survey – which suggests a relatively high level of engagement. There’s also the possibility that individuals could have ‘gamed’ the poll by multiple submissions – however, this does not seem to be the case from the pattern of data I received. We asked a series of questions (1 – 3) about people’s perceptions of the land market, and these were perhaps the most interesting. 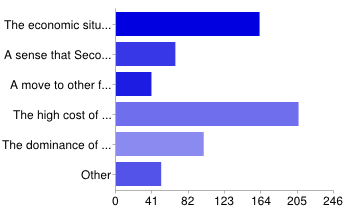 When asked what people thought are the major factors causing the decline of private landholding in Second Life (i.e. the 11% drop in the number of private islands identified by Tyce Shepherd), three main factors were identified (and, as people were allowed to select more than one response here, percentages come out totalling more than 100%). The overwhelming factor identified was the high cost of tier (84%). However, 66% also identified the economic situation in the real world. 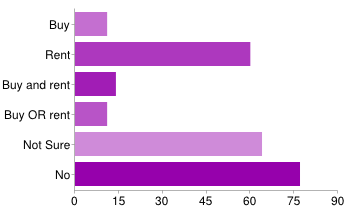 The third factor identified (41%) was the dominance of the marketplace making holding land less viable. This is something I’ve discussed on this blog before – and it’s interesting to see that this is a widely held perception. 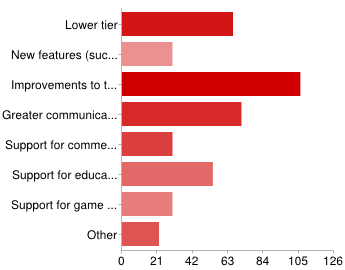 Interestingly, although only 16% perceived that a cause for decline was a move to other forms of social gaming, some opf the ‘other’ answers indicated a move to other grids as a possible reason for decline. 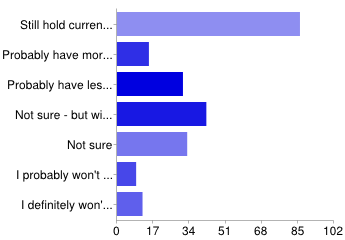 27% thought a sense that Second Life is outdated could be a reason for the decline but, interestingly, this is not supported by later questions about Linden Lab innovations on the grid. The question as to what single factor would make people more inclined to buy or rent land in Second Life was the most unambiguous of all. 70% said that lower tier would make them more inclined to buy or rent land. In addition, of the other 30%, a full 29% cited lowered tier as a significant factor in inclining them to buy or rent land. In other words, 99% of respondents said that lower tier was a significant or the most significant factor in inclining them to buy or rent land in Second Life. I have to admit, that level of unanimity rather startled me. The other leading factors that people thought would make a significant factor in their decision to buy or rent land were improvements to the grid (47%), greater communication with the Lab (31%), and support for educational or non-profit enterprises (24%). The introduction of new features such as Pathfinding tools seemed to excite little enthusiasm. One thing that is clear (and perhaps not surprising, given the points made above) is that a high proportion of people responding are land owners/renters. 87% either own, rent or both own and rent currently. Even that high figure, however, hows a decline from the past where 94% either owned, rented or both owned and rented. That small decline is more interesting when we examine how each category has changed. In the past, 45% owned and rented land. That figure has now declined to 20%. However, there has been an increase in people who own land from 23% to 32%, while the rental market has shown a similar increase from 26% to 35%. 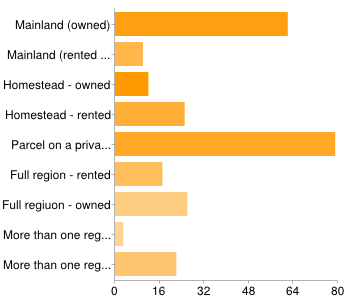 When it comes to types of land held, the highest proportion was parcels on private estates (42%), followed by owned parcels on mainland (33% – which would, of course, include the free land or Linden home that comes with premium membership). Larger land parcels seemed less popular – only 19% owned or rented a homestead; 23% owned or rented a full region (which would include commercial regions that house stores) and 14% owned or rented more than one full region. This question allowed people to specify all their types of land, so the percentages can to more than 100% – I myself have a Linden Home and rent several parcels on private estates, for example. The question about land holdings for those with larger holdings is slightly problematic. Question 9 was, in fact, aimed at land barons and others who own or rent more than one region. Although only 25 people had indicated this type of land holding in Question 8, a total of 136 answered the question. This may well be held to invalidate this question. However, its findings were in line with other questions about land holding intentions: 31% expected to be holding about the same amount of land; 19% expected their holdings to be smaller and only 4% expected them to be larger. This is a pattern of muted stability tending towards slow decline – it’s what Tyce Shepherd’s figures have been suggesting. Looking at people’s expectations overall, in Question 7, the trend still seems to be stability – with 35% expecting to hold their current land by the end of 2013. However, there is a sizeable body of people who expect to have less land or no land – 22%. In addition, a full 30% are not sure (with 17% of those expecting to still hold some land – although not necessarily their current holdings). Only 6% expect to probably hold more land. This again reflects the pattern of what I’m calling muted stability, tending towards slow decline. Future intentions of patterns of land ownership are also interesting. A full 57% either have no intention or are not sure about buying or renting in the next year. Of those that do intend to acquire land, the largest number (24%) intend to rent – which suggests that there is still potential for a land market. Here are the full figures. Feel free to add your own thoughts and comments. 1) What do you think are the major factors causing the decline of private landholding in Second Life? People could select more than one checkbox on this question, so percentages add up to more than 100%. 2) What single factor would make you more inclined to buy or rent land in Second Life? 3) In addition to your previous answer, what OTHER factors would make you more inclined to buy or rent land in Second Life? 4) Do you currently own or rent land in Second Life? 5) Have you owned or rented in the past? 6) Do you plan to buy or rent land in the next year? 7) If you buy or rent land, do you expect to still hold land (not necessarily your current land) at the end of 2013? 8) If you have land, what sort of land do you have? 9) If you own or rent more than one region, do you expect your landholdings to be larger or smaller by the end of 2013? Since most people who responded already have some land, the “big question” really became “Would you buy more units if they were cheaper”, to which the answer unsurprisingly is “Yes”. This jibes well with my impression that people generally have a set amount of money they are willing to spend, and get as much as they can for that. 1) “Would you spend more money if the units were cheaper”, to which I strongly suspect that the answer would be almost as unequivocally “No”. 2) “If you do not have land, would you be more likely to buy/rent your first parcel if prices were cheaper”. Obviously, some would, but the big questions here are whether enough would to offset the overall loss of income, and whether the majority of those who are willing to invest in land at all already do so (as per above, getting as much or as little as they can for the amount they are willing to spend). I would love if it was easier/cheaper to get some “playgrounds” for, say, art projects or roleplaying communities. This kind of high-end hobby use suffers badly from the tier cost, but whether the untapped segment here is big enough, I really don’t know. So despite me obviously wanting cheaper prices as a consumer, all this leaves me with a feeling that merely fiddling a little with the land prices would do very little. We would need a change which is big enough to essentially be a new business model, and that is obviously not something LL can easily do. (And SL is sort of painted into a corner, with a lot of financial dynamics relying on the old style). I do think, however, that we will ultimately need such a change. At some point, “server hosting” will not work as business model, but I do not have a clear answer as to what should replace it, and I do not expect it to happen any time soon. Look up The Chronicles of Xcalibur, they’re trying to create a 400 sim roleplaying area, which is ambitious to say the least. I’m not sure what’s going on there, but they do thank Anshe RPG sims in their credits, I currently see 2 sims on the grid, so only another 398 to go. I’d love to see easier/cheaper sims for roleplaying, arts, playgrounds etc. 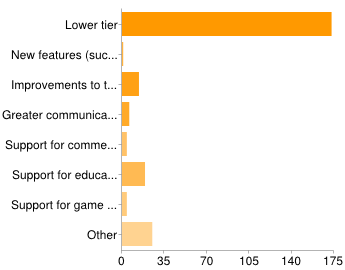 too but Linden Lab need other revenue streams to facilitate lower tier. I agree with you about server hosting not being a long term business model, it feels a bit like the subscription models for MMO’s that are not working anymore for new ventures, Secret World went free to play this month. The thing is, and you touch upon this, lower tier does not automatically mean more income, or even the same income, whereas it would likely increase Linden Lab’s costs as I’m sure a big drop in tier would halt the land ownership decline. Linden Lab need to get their thinking caps on, tier is still very healthy but trajectory will continue downwards. I suspect Xcalibur is as much pitching the idea to LL as to any interested residents, effectively fishing for a “LEA grant for roleplaying”. -Which could, in fact, be one way to do it. “Give us the resources, and we promise – with some form of accountability – that we’ll provide the manpower to create something cool for the SL platform”. LL would still need some way to ultimately monetize it, but it’s not far from what’s being done with the LEA currently. I am struck by the parallels between Linden Labs and AOL and some differences that might enlighten your discussion. Like Linden, AOL was expensive and competed with several similar if smaller ISPs. Then AOL dropped its per minute pricing and overnight blew out every other provider and forced them into bankruptcy. If it had continued with its consumer driven policies it still might dominate the Internet as it did then, but the bean counters went to work and very soon it had nothing of value to sell over any other ISP. Like AOL, Linden dominates the market, and like AOL they have become self satisfied with that dominance. Also like the ISPs of that time other Grids are sprouting like mushrooms, with movements afoot to link them all into a giant grid. The other grids are also in a price war of sorts to build volume to that point that the volume at least approaches the feeling of parity. By eliminating support for non profits, Linden lost more than the income from those grids, they also lost a large source of activity that brought people to SL and provided places for them to visit and things to do. Like AOL if Linden cut the price of tier severely those already there would not increase their use much, but there would be a much greater increase in participation from folks who currently dabble, and their friends who do not even play. Rather than dumping non-profits, Linden would do well to create their own, and perhaps sell advertizing to help support communities that focus on specific issues or even build the abilities of everyone in the arcane arts of the grids from building and scripting to terraforming. This would go a long way to building users who might eventually spend a lot more time and money but cannot start out cold doing so.